A while back I posted here that I had discovered that some of the K Line cars were REALLY nice. At that time I mentioned that I had always thought that K Line stuff was very "entry level", but had found that some of their stuff was at the same level as the better Lionel or Atlas offerings. I've since purchased a couple of the die cast 2 bay hoppers (both came in the yellow and black boxes) and they are beautiful...and heavy! Anyway, while looking at eBay I see that there are similarly designed boxes that are either in black and red, or black with blue colors. My question here is: do these 3 different colored boxes represent different levels of detail? Also, they had what they called a "Classics" line. These appear to have come in a black box with gold stripes; kinda reminds me of Weaver boxes. Were these cars typically more detailed then their other offerings? Some of the variation is simply new graphic design. Blue & white boxes with yellow lettering. Maroon boxes with gold lettering. Black and gold boxes. I could be wrong, but I think these coincided with the introduction of scale cars. The scale cars have "O Scale Classics" and the non-scale cars typically say "Freight," for example. Yellow and black boxes, which lasted up through K-Line's "acquisition" by Lionel. I've only seen O/O27 cars in the red and black boxes, and then later they introduced the "Train 19" blue and black boxes for O/O27 cars, but these were concurrent with the yellow and black boxes. 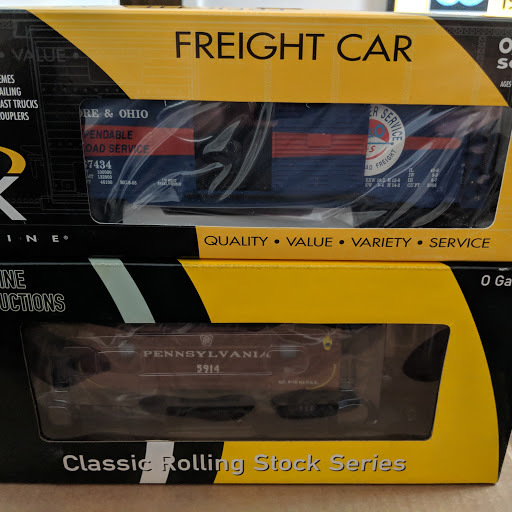 If you are looking for detailed scale cars, look for the black and gold boxes that say "O Scale Classics" or look for the yellow and black boxes that say "O Scale" in the upper-righthand corner of front of the box. A good web site to help identify KLine http://www.legacykline.com/apps/kl/catalog.html. And yes, in my opinion, K line made some real sweet cars and locomotives, especially and probably only, their scale products. I am particularly fond of their 18” scale passenger cars and in particular their Golden State aluminum cars. Never seen much of their steam locos. The ones i’ve Run across were not scale size. Some of the variation is due to change in graphics some is simply new graphic design. Thanks Matt Big help have been picking up some Yellow and Black O scale items very nice the diecast hoppers are heavy!! Based on the information I've received here, I went ahead and "pulled the trigger" on a "K Line Classics #K761-1891 PRR Weathered Boxcar". It appears to have free-standing ladders and grab irons, sprung trucks and a very nice see-through roof walk. I'll be sure to mention it in the "Buy anything cool lately?" thread when it arrives. Yellow and black boxes, which lasted up through K-Line's "acquisition" by Lionel. Lionel did not actually acquire K-Line, though it did end up with some limited tooling — most notably, the upgraded version of K-Line’s A5, which is still in production as a LionChief model. K-Line filed for bankruptcy (Chapter 11) in 2005, in part due to the financial impact of a costly lawsuit by Lionel concerning K-Line products that infringed on Lionel’s technology. In concert with the lawsuit settlement, K-Line’s Chinese manufacturing partner Sanda Kan acquired the K-Line brand and all of K-Line’s tooling, primarily as debt payment for money owed to the factory for products already produced but never shipped. Sanda Kan, in turn, licensed the name for use by Lionel, which included a line of K-Line by Lionel trains for several years, beginning in 2006. Sanda Kan eventually sold some of K-Line’s tooling to other companies, including Lionel and Atlas. But much of the tooling remained with Sanda Kan when the factory was acquired by Kader, a major toymaker that also owns Bachmann, in 2008. In 2010, Kader famously abruptly ended all manufacturing agreements with roughly 70 model train companies globally, including Lionel, Atlas and Weaver in the American O gauge realm. Heartland acquired much of the excess unshipped K-Line inventory and sold it in O-Line boxes that mimicked K-Line boxes until the product sold out. RMT is still using tooling from Sanda Kan for its product line. Because Bachmann acquired Williams at roughly the same time, the Williams by Bachmann brand still uses tooling from Sanda Kan, though much of Williams tooling has apparently been retired in recent years. Jim R Thanks for the time line!! nice cars not to scale Bottom photo compares the same B&O boxcar to a full O scale stock car. So you can't just go by the box colors: it looks like a key difference is the "O/O27" label vs. the "O Scale" markings. All good stuff to know, thanks! Generally speaking the K-Line 6xxx series is "traditional" size and the 7xxx series is full scale. Some things are scale size regardless of the number, like the single dome tank cars and many of the cabooses. That is also super helpful, thank you. For the black-and-gold and the black-and-yellow boxes that is correct, and indeed regardless of the era of box, looking for the O vs. O/O27 label somewhere on the box is the safest way to go. O Scale products will say "O Scale" somewhere on the box. In the case of the black-and-gold boxes, it will say "O Scale Classics," and in the case of the black-and-yellow boxes, it will say "O Scale" in the upper-right-hand corner on the front of the box. On the "traditional" O Gauge products, it should say "O/O27" somewhere. Jim, your posts always show some above-average understanding of the hobby business. But a few corrections are in order here. Heartland Hobby, a distributor, acquired the remaining RMT inventory (not K-Line) and repackaged that under the O-Line banner. Draw your own conclusions for why this happened. Current RMT product, it would be safe to say, is not being produced at Kader (Sanda Kan) but is most likely being made at the same facility that produces train products for Menards. As to my memory, when all the various companies were dropped by Kader, there were a few exceptions at that time. Lionel was not dropped and neither was Aristo Craft. If one remembers, it was shortly before this move, that RMT paired up with Aristo Craft. Not only was there an planned expansion of the RMT product line, but it also allowed for continued production at the Kader facility. If one recalls, there were quite a few products, like production of the former K-Line 4-6-2 starter steam engine, that never came to be. And while the lawsuit between Lionel and K-Line - and the resulting press releases - may have expedited the inevitable, K-Line had a nearly 4 million dollar debt with Sanda Kan, which they would have had a hard time paying, even without the results of the lawsuit. That's a point not worth ignoring. 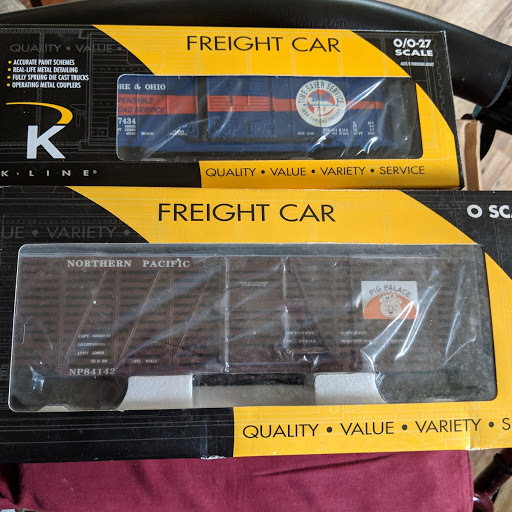 People blame Lionel for the demise of K-Line, but much of the cause was with K-Line itself... or the market for not adequately supporting the K-Line products (especially the scale stuff), until they were being massively blown-out. Anyone who likes K-Line products knows the hardest product to come by are the items made towards the end of the life of the company. It had gotten to the point where K-Line couldn't receive new product without it being paid for in advance. I was waiting for you to chime in, Brian. Your knowledge in this area is more specialized and precise. To further clarify, the K-Line name and logos were transferred to Kader's Hong Kong attorney. This was done after the trademark renewal lapsed. I have copies of this paperwork filing attained via public records release. Interestingly, at the time of renewal, the trademark was not the property of Maury Klein, but Albert Ruocchio and is stated as such on the documents. I believe Mr. Ruocchio was acting as Agent of Record at the time. If I win the Lottery I will hog all the scale sized K-line I can find. Just kidding. I probably would collect some of their nicest offerings, though, like their 21" passenger cars and matching F unit sets and steam engines. There's what I miss about them going under. If Maury was overly ambitious, ok, but I still very much appreciate what he was trying to accomplish. Once again, I want to thank everyone who has taken the time to chime in here and educate someone such as myself about this product line. I really had no idea. This car arrived today. It's a "Don't Stand Me Still" car, with data number "X290". It is very nice indeed, but I do have a question: it also has markings "Rebuilt 1-99". It seems to me that this type of car is too new to have been rebuilt in 1899, but too old to have been rebuilt in 2009. Mark, The "rebuilt 1-99" refers to a K-line marking in that the car was made in 1999 The one would indicate first edition. I guess for many years my loyalty to the big L made me avoid K-line products. I do still have my first Lionel set the 1656 Switcher with the ringing bell tender! Over the years it did have a marker light amputated and groves are worn in the drive wheels from use! I haven't quit figured out on how to take it with me, but I'll work on that!! Okay, I got it now. It doesn't refer to the actual car (prototype), but to the "actual" car!